Naturally deodorize, moisturize, and illuminate any room with PureSpa XL from Pure Enrichment. 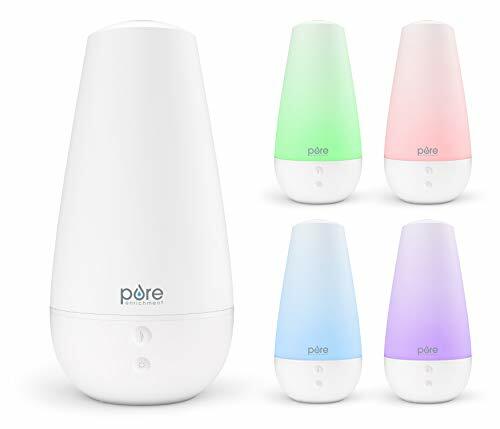 This powerful humidifier, aroma diffuser, and mood light trio can handle all three tasks with ease. Use each feature individually or together to create a more comfortable environment in your home or office. Simply add water and your favorite 100% pure essential oil to enjoy the therapeutic benefits of PureSpa XL. Aroma Coverage: Up to 350 sq. ft.
LARGE TANK, SLEEK DESIGN: Ample 2-liter (2,000ml) water tank fits sleekly into a stylish design that complements any decor. 15x bigger tank than standard aroma diffusers. POWERFUL STEAM OUTPUT: Choose from high and low settings to use as a humidifier or aroma diffuser to naturally refresh any room. RAINBOW-SPECTRUM MOOD LIGHT: Enhances the ambiance with soft glow lighting that either rotates between colors or allows you to choose your favorite color and keep it on that. INDEPENDENT LIGHT & MIST: Offers the flexibility to use the mist and light features together or separately. WHAT YOU GET: PureSpa XL, ETL-approved power adapter, user manual, industry-leading 5 Year Warranty, caring customer support 7 days a week, and the peace of mind that comes from a trusted brand with millions of customers worldwide. If you have any questions about this product by Pure Enrichment, contact us by completing and submitting the form below. If you are looking for a specif part number, please include it with your message.